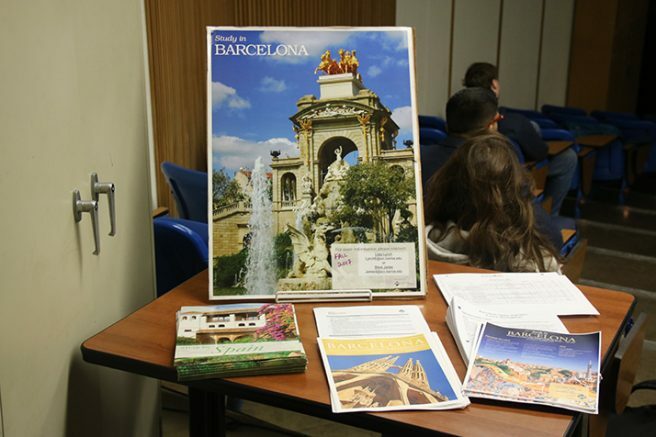 During ARC’s College Hour, which was held February 2, professor Steve James shared information in regards to the college’s study abroad program in Barcelona, Spain. James, an environmental and conservation biology professor, has been with the program for two years. His program will offer students a 13-week semester in Barcelona in fall 2017. During the semester transferable courses will be offered in biology, mythology, art history, history, liberal arts, math, critical thinking and humanities. Instruction days will be held on Mondays and Wednesdays for two hours at a time. A Spanish life and culture course is also part of the curriculum. Students who choose to make this leap across the globe will be greeted at the airport after landing by an acquaintance with a welcome sign. The student living situation will be a shared apartment with four people assigned to each room, or for an additional $800 dollars, a home stay with a local family. James said the program is a good opportunity for students. “These programs change you, they change you in a really big way,” he said. James added that his own son has participated in the program–something that helped him become a more seasoned traveler. “He can probably get off a plane in an airport at any place and figure it out,” he said. The overall cost of the trip is $7,545 dollars and financial aid, including the BOG waiver may be used towards the trip. James also highly recommended that students look into the “Foundations” scholarship, which can help subsidize the cost. “Last time I checked, free money is the best money,” James said. Among the courses offered, there will also be a plethora of amenities for students to use or to participate in. There will be day trips, cooking classes, soccer matches, wine tasting, flamenco and museum trips. Transit passes will be offered and free wi-fi is available. Students can also take advantage of group medical insurance and there will be a 24 hour emergency phone service..
Transportation costs are to be announced, but James estimated them to be anywhere from $1,300-$1,500 dollars. Optional weekend travels will also be available. If the fall trip is too costly to any students interested, the summer trip is $4,000 dollars, but it does not include airfare, James added. The deadline to register for the semester is May 5, 2017. The semester will span from Sept. 8 through Dec. 2017. T.J. Martinez is a first semester student with the Current. He is a studio art major but intends to receive an AA in mass communications and journalism before leaving American River College. He currently doesn’t know where he’d like to transfer. Be the first to comment on "“Travel is the only thing you buy that makes you richer”"